Today was an interesting gospel… Jesus actually drives a demon out! Here’s the text for anybody who was too busy wrestling children (ahem… guilty) to really pay too close attention to the gospel, here it is! 21 Then they came to Capernaum, and on the sabbath he entered the synagogue and taught. 22 The people were astonished at his teaching, for he taught them as one having authority and not as the scribes. 23 In their synagogue was a man with an unclean spirit; 24 he cried out, “What have you to do with us, Jesus of Nazareth? Have you come to destroy us? I know who you are—the Holy One of God!” 25Jesus rebuked him and said, “Quiet! Come out of him!” 26The unclean spirit convulsed him and with a loud cry came out of him. 27All were amazed and asked one another, “What is this? A new teaching with authority. He commands even the unclean spirits and they obey him.” 28His fame spread everywhere throughout the whole region of Galilee. See? What a fantastic gospel! 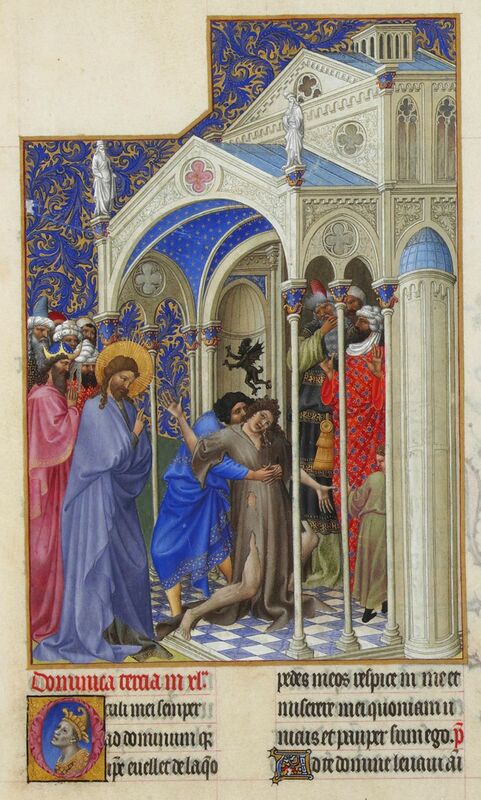 The Exorcism from Les Très Riches Heures du duc de Berry, c. 15th century. Musée de Conde, Chantilly, France. While everyone crowds around Jesus, some looking at Him prayerfully, others with astonishment, Jesus talks to the poor possessed man directly. And, out springs a demon! What I find of particular interest is that Jesus is addressing the man, in particular, and holding His hand in the sign of the blessing. The demon is out, so Jesus’s focus seems to be on the man, not on the demon who is now powerless without a host. And that reminds me that Jesus came, not to really directly confront evil (though, He did that plenty of times as well! ), but rather to invite and unite us to His Kingdom. Though sometimes we can be plagued by demons of all different shapes and sizes, Jesus reminds us that He has power over all and, if we only listen to His voice, we can reach out and trust Him. And that is something that we can all be thankful for! Be honest… in this artwork, what sort of face do you identify with most if you saw something like this happen in church? If Jesus were to drive out any demon from you, which one would you hope that He would get rid of? Which demon would you hope He would allow to stay? Drive out our demons and unite us more perfectly to You.